Citizens of the United States, as consumers of news and participants in democracy, must prioritize reliable journalism. Last week, nearly a thousand journalists were laid off. Employees for Huffington Post, Buzzfeed News and newspapers owned by print media giant Gannett Co. lost jobs. It’s another blow in a long line of hits to the newspaper industry. In 2018, New York Times CEO Mark Thompson said that “I believe at least 10 years is what we can see in the U.S. for our print products,” but that newspapers would shift their strategies to deal with these trends. With so many layoffs happening, though, that doesn’t seem to hold quite true. Fewer employed journalists means a reduction in quality or quantity of news. They simply do not have the time or energy to investigate every tip, cultivate sources and write substantial pieces the way a fully-staffed newsroom could. Is this the way print media dies? Inconclusive, but it is a punch on the chin to democracy. Newspapers are vital to living in a society where elected officials make decisions about your day-to-day life. Your taxes, roads and school districts are regulated and budgeted for by others. The news tracks these decisions and notifies the public about items of concern. Maybe that makes the news depressing, but it’s also a reflection of your reality. The work these people do is important: it uncovers the ways, surprising and shocking and sometimes mundane, that people are affected by social and federal forces bigger than themselves. It is unequivocally necessary. To say otherwise is to disrespect the journalists who dedicate their lives to uncovering truth and to give in to the naive belief that the powers that be will have your best interests at heart. Breaking news: this presidency proves that the U.S. is one uninformed election away from disaster. So what’s to blame for this downward spiral in print media? Most revenue for newspapers comes from advertising. But advertising is moving online, print media costs money and America is losing faith in journalism. Journalism hasn’t adapted to consumer trends, and that problem lies squarely at the feet of the CEOs and presidents of the corporations that own newspapers. It hasn’t captured the advertising market it will need to continue to pay reporters and create a thriving journalism scene that will create a culture of accountability. But regardless of how newspapers are currently funded, the general public needs to make news a priority. We need to support journalism now more than ever and work to suggest and create sustainable news models that benefit the public and allow journalists to continue their work. Professions are shaped by the people who work in and support them. America has not supported accountability or truth recently. It is our job, as citizens in a democracy, to pursue truth and hold our governments and elected officials accountable. “Fake news” is a problem that we ourselves created by refusing to take the extra five seconds to google news and news sources. We share it, and then we blame honest-to-goodness journalism for the consequences of our laziness. If we want to revitalize our government, we have to put time, money and effort into our news. You don’t have to read every paper in the nation, but turn off your ad blocker when you check L.A. Times. Encourage your grandparents to buy a subscription to the Washington Post. Donate to NPR. Share news stories from your local paper on Facebook. 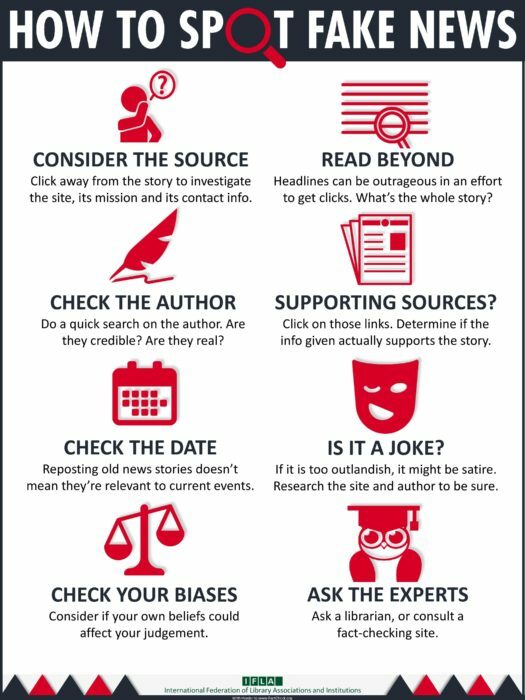 Vet your news sources. Engage with news stories that matter to you. For the love of all that’s honest and worthwhile, support the truth in whatever way you can.